Guest Post: Shea on Remixing Pattern Shorts and Cute Toddler Pictures. Hey guys. While you read this I am just settling in during the first few days back in Michigan, catching up with my family and Vivian is probably being spoiled a ton lol. But I am continuing with my fabulous Guest Posts. Today we got another Mommy Blogger here and we are both new moms to toddlers born in 2013. Say hello to Shea. I like to think as new moms to very busy, active toddlers Shea and I have not only similar styles but similar life-styles as well. I, just like Shea, have been living in my Shorts this Summer, so way to go Shea. Shea always looks so put-together even when she is at her most casual. She is one Elegant Toddler Mom. Hi Elegance and Mommyhood readers! I'm Shea from Shea Lennon and I'm so happy to be here on Ada's blog today. Like Ada, I'm the mom to a toddler; my son Jona will be two in just a few days. As a busy working mom, I need a wardrobe filled with pieces that work hard for me. For hot summer weekends in Kansas City, I've been living in shorts. I love this patterned pair because they're so easy to dress up or down. 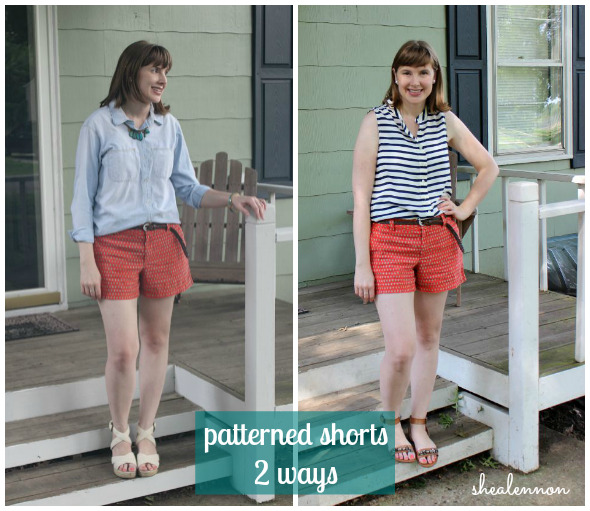 Here are two ways I've been wearing my shorts lately. One of our favorite things to do as a family any time of year, but especially summer, is eat. (Well, Jona's not a great eater, but I'm hoping he'll realize his true eating potential in time.) Kansas City is home to lots of amazing restaurants, and this look is perfect for a family lunch date at one of our favorite spots. Another thing we like to do in the summertime is visit the farmers's market. We try to go early in the morning before it gets too hot, and Jona always enjoys seeing the food, the flowers, and of course the people. Oh Shea, you styled those adorable orange shorts so well. I am a huge fan of pattern-mixing as you know so the second outfit wins me over a little more, especially since Shea is coordinating with her Handsome Jona and you all know I love coordinating with my Vivian. But I also am a huge fan of the Look of a tucked-in Chambray Shirt with Shorts. Shea's Sandals (both pairs) are so cute here. And Shea my friend - I feel you - Vivian is not a good eater, either. Thank you for stopping by today. Now, go visit Shea.